What started as a small group dinner showcasing chef Ryan Harrison's new restaurant, Preservation and his cured, pickled and smoked items quickly turned into a full blown Chowdown. The Chowfather Chowdown that went down at Preservation last month was organized spontaneously and sold out quickly. After enjoying another good meal I casually tossed out the idea of doing a small group dinner for some die hard food fans to Ryan's partner Nicole Richaud who is also a CIA trained chef. I thought it would be a fun way to have some new people sample their menu. An email and a couple of text messages from Ryan later and the chowdown was on. In one week. A couple of tweets later and twenty five food fans were in. Instead of taking the easy route by serving the highlights from his daily menu, he elevated his game and prepared a creative eleven course tasting menu. What impresses me most about Ryan is his enthusiasm and passion for what he is doing. These are two traits that are innate. They will serve him well as he continues to grow as a chef. I look forward to watching the evolution of Ryan and Preservation. A big thanks to everyone who came out blindly to support a new local spot. It was an enjoyable night with a great group of old and new food loving friends. The wine pairing was courtesy of Charles Ferrin of the new wine and spirits store in Hallandale, Mas Vino. For some great shots of the dinner check out Frodnesor's flickr set. You can follow Ryan on Twitter as well as the restaurant feed. Sous chef Adam and Ryan greet the group. Loved my seat at the head of this great table. And for the record, I didn't bring that pimped out chair. All smiles as the free bourbon was flowing... Of course! Before we sat down guests were treated to a sampling of Ryan's pickled items. Pictured above are his tasty and crisp pickles and asparagus. Not pictured is his giardiniera and his pickled green beans. Course one featured a delicious smoked scallop "bonito flake" dashi paired with a coddles quail egg, kimchi and compressed watermelon. Charles opted for a nice Kikusui junmai ginjo sake. Duck Duck Goose paired a truffled duck confit crepe with foie gras torchon and housemade gooseberry and orange marmalade. Charles paired this with a muscat from Chateau Cabezac. Pickle Soup!! featuring Jersey Gina's Gems a/k/a Ryan's Mom's relish and dill. Gnocchi with lump blue crab, seafood velouté, black truffle and spicy sprouts. Ryan's riff on paella consisted of gulf strawberry grouper, smoked local littleneck clams, Spanish octopus, Berkshire lardon, Berkshire powder and bomba rice. One of my favorite dishes of the night was Ryan's jerk spiced goat leg paired with pearl onions, turnips and topped with a Dragon Stout foam. Awful shot of another dish I enjoyed. Here, Ryan playfully paired braised oxtail with a potato "marrow bone" as well as beef tongue with blackberry mostarda. Here is a link to a MUCH better shot. Next up was another winning combination. Pied de Cochon, sweetbreads and truffled arugula salad. Ryan's next dish was a tribute to his parents. His granita included his Dad's limoncello and his Mom's blueberry butter. A cheese course followed and included blue cheese, tempura manchego, smoked honey and pine nuts. The last bite was "Ambrosia" Ryan style. Watermelon gelee, banana panna cotta, strawberry and banana marshmallows and chips. 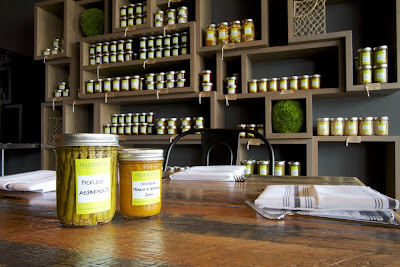 It should be noted that Ryan's pickled items and preserves are also jarred and available for retail purchase. So agree about Ryan being passionate and into his cooking, so talented. We need to support these chef owned restaurants. Neat to introduce foodies there.